As we began a new millennium it seemed fitting to remember and honour St. Brendan the Navigator, a native of Fenit in County Kerry, Ireland who is one of the the most important Kerrymen ever and who ranks with Colmcille and Columbanus among the most important of Irish saints. 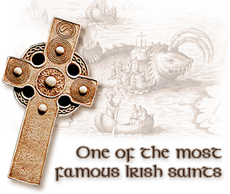 We invite you to spend some time on our website to discover more about Saint Brendan and his historic deeds as well as learning about some of Ireland's s history and the tough conditions at the time. Learn about the beautiful area, the lure of the ocean as well as the story of the monument and the passionate team behind the venture. The unique and imposing sculpture by Tighe O Donoghue/Ross of Glenflesk stands on Samphire rock at the entrance to Fenit Harbour, Kerry, Ireland gazing out over the Atlantic ocean, pointing in the direction of America. In 484 Saint Brendan was born in Fenit near the port of Tralee, in County Kerry, in the province of Munster, in the south west of Ireland. He was baptized at Tubrid, near Ardfert, by Saint Erc. After a year at home with his parents, he was fostered by the local chieftain, or taoiseach, Airde MacFiadaigh, at his fortress Cathair Airde, and he completed his studiesunder Bishop Erc..
As Kerry prepares to celebrate the Gathering of Kerry people to honour Saint Brendan the Navigator on the week of his Feast Day May 16th, it seems proper to say a little about him. We knew that the Celts founded the first Europe, but very few are aware that Irish monks had a very important role in Medieval Europe, which they transformed culturally and spiritually.